Steel does not warp, shrink, or crack in normal loading and framing applications. Steel is ductile, and will bend and stretch when overloaded, rather than cracking or breaking like unreinforced concrete or masonry. Steel is 100% non-combustible. 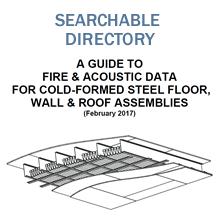 Therefore, height and area restrictions on combustible materials do not apply to cold-formed steel. The International Building Code (IBC) and other building codes limit how tall a building can be or how much area can be encompassed by the building based on several factors. The primary factor is the combustibility of the products used for the building. Table 503 of the IBC categorizes buildings by construction type and use group, and gives the maximum building height in feet or stories, and the maximum area in square feet. Cold-formed steel (CFS), being totally non-combustible, can help developers and builders use land more efficiently by allowing taller and wider buildings for the same occupancy classification. For mid-rise buildings in the 4 to 9 story range, CFS is much more cost effective than heavier construction. It also has a more predictable schedule that can shave months off the total project cycle time.